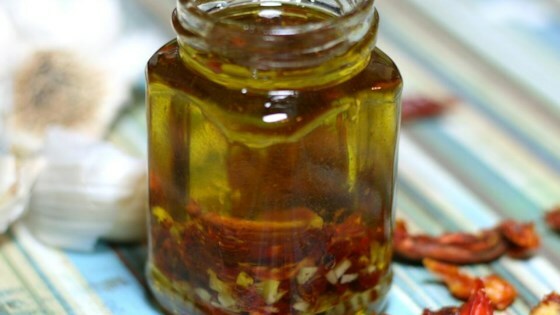 "You can use just the infused oil or the garlic and tomatoes, too! This oil can be used as a salad dressing, bread dip, or even to add flavor to your favorite saute." Place garlic and sun-dried tomatoes in a 16-ounce dark glass bottle. Pour olive oil into the bottle using a funnel. Close the bottle tightly and refrigerate, 8 hours to overnight. Store the infused oil in the refrigerator. Dark glass will keep the oil from going rancid too quickly. Excellent! Why haven't I done this before?! Makes a delicious salad dressing. Next I will try as a dipping oil with some freshly grated parmesan. Thanks for the recipe!